At land is not as well-known as the movies I usually feature in this series, so maybe some explanation is in order. It is a silent American short film from 1944 directed by and featuring Maya Deren.1 It is about, about – well, actually, that’s not true. It’s not sensu strictu about anything. Let’s rather say that it includes a woman waking up on the beach. She very slowly gets up, climbs up a fallen tree’s trunk – which is also a table at which a fancy dinner party is being held (yeah, it’s that kind of movie) – and crawls along it. When she reaches the end of the tree/table, we finally see what has attracted her attention: a chess game in progress. Well, at least she’s a lady of taste! But why on Earth is that guy moving black’s queen to h4 sitting on the side of the board? I know that it’s probably because having someone at the head of the table gives a nicer shot, but, in universe, why is that guy moving black’s queen to h4 sitting on the side of the board? Whatever the reason, it quickly disappears, because he gets up and leaves, never to return. Our protagonist keeps watching the board, on which pieces move around without being touched. And they move fast: every move is executed a tempo. Soon, a familiar scene unfolds: a king’s gambit, with Bc4 and Qh4+, after which white’s king’s knight moves to f3, h4, and f5 – this must be the immortal game!2 Yes, indeed, it is the most famous game in chess history, a friendly game played by Adolf Anderssen and Lion Kieseritzky in London 1851 during a break in what is usually called the first international chess tournament. Sooner or later it was going to happen, of course, and the day has finally come. Except that it hasn’t, it only looks like it! According to all sources I have checked, in the real immortal game, black plays 8. … Qg5 and then 9. … c6, but whoever is moving the pieces around on this board first goes 8. … c6 and only after 9. Nf5 follows up with 9. … Qg5. And then, after 10. g4, black doesn’t retreat the knight and instead captures the g-pawn with his queen – a spectacularly bad move. The captured pawn then lands in the sea (again, it’s that kind of movie) leading our protagonist to chase after it. On the beach, she finds two women playing chess. It’s the immortal one again! By now they’re at move 17,3 but only three ply later they stray from it again: instead of 18. … Bxg1, black plays 18. … Qxa1. That’s probably a better move, but they quickly fall back to the immortal game and the last few moves are faithful copies again. 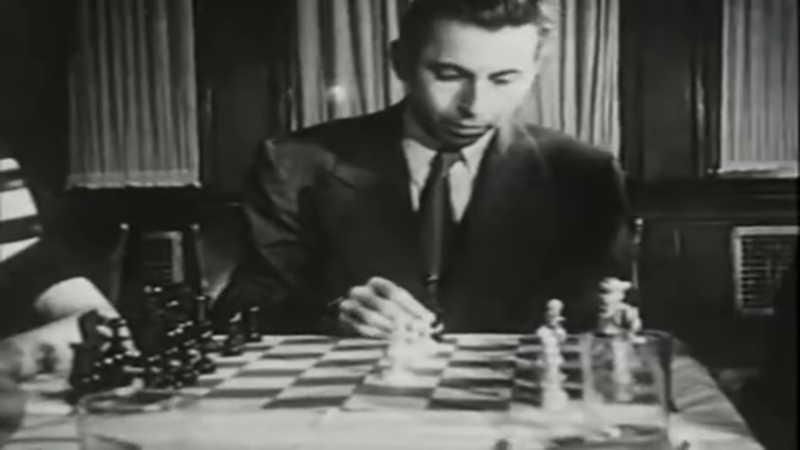 After the mate is finally delivered, the protagonist steals a white pawn and runs of. At this point the movie stops, probably because the screenwriter had written himself into a corner. Realism: 3/5 I would have given full marks had it really been the immortal game , but it isn’t. 10. … Qxg4 costs at least another full point.